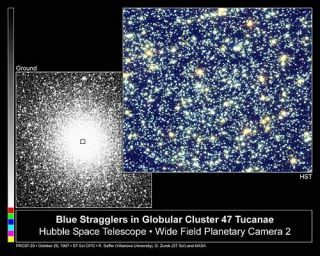 The core of globular cluster 47 Tucanae is home to many blue stragglers, rejuvenated stars that glow with the blue light of young stars. A ground-based telescope image (on the left) shows the entire crowded core of 47 Tucanae, located 15,000 light-years away in the constellation Tucana. Peering into the heart of the globular cluster's bright core, the Hubble Space Telescope's Wide Field and Planetary Camera 2 separated the dense clump of stars into many individual stars (image on right). Astronomershave found what they say is the strongest evidence yet that a mysterious classof stars known as "blue stragglers" are the result of stellarcannibalism. Bluestragglers are found throughout the universe in globularclusters ? which typically are collections of about 100,000 stars, tightlybound by gravity. Because all the stars in these clusters are thought to havebeen born at the same time, they should all be the same age, but bluestragglers appear to be younger than their cluster peers. The originof these strange, massive stars has been a longstanding mystery, said studyleader Christian Knigge of Southampton University in England. "Theonly thing that was clear is that at least two stars must be involved in thecreation of every single blue straggler, because isolated stars this massivesimply should not exist in these clusters," Knigge added. Since theseoddball stars were first discovered more than half a century ago, two competingexplanations for their formation emerged: "that blue stragglers werecreated through collisionswith other stars; or that one star in a binary system was 'reborn' bypulling matter off its companion," said study team member Alison Sills ofthe McMaster University in Canada. A 2006study examined the chemical signatures of 43 blue stragglers in theglobular cluster 47Tucanae, and found that six of the unusual stars had less carbon and oxygenthan the others. The anomaly indicated that their surface material had beensucked from the deep interior of a parent star in a binary system. The newstudy, detailed in the Jan. 15 issue of the journal Nature, provideseven more evidence in favor of the stellar cannibalism idea. Theresearchers looked at blue stragglers in 56 globular clusters and found thatthe total number of blue stragglers in a given cluster didn't match thepredicted collision rate ? dispelling the theory that blue stragglers arecreated through collisions with other stars. But therewas a connection between the total mass contained in the core of the globularcluster and the number of blue stragglers observed within it. Since moremassive cores also contain more binary stars, the researchers could infer arelationship between blue stragglers and binaries in globular clusters. Thisconclusion is also supported by preliminary observations that directly measuredthe abundance of binary stars in cluster cores. "Thisis the strongest and most direct evidence to date that most blue stragglers,even those found in the cluster cores, are the offspring of two binarystars," Knigge said. Though there is still plenty of research on thesestars to do. "Inour future work we will want to determine whether the binary parents of bluestragglers evolve mostly in isolation, or whether dynamical encounters withother stars in the clusters are required somewhere along the line in order toexplain our results," Knigge said. The studywas funded in part by the United Kingdom's Science and Technology FacilitiesCouncil.